Morning all! 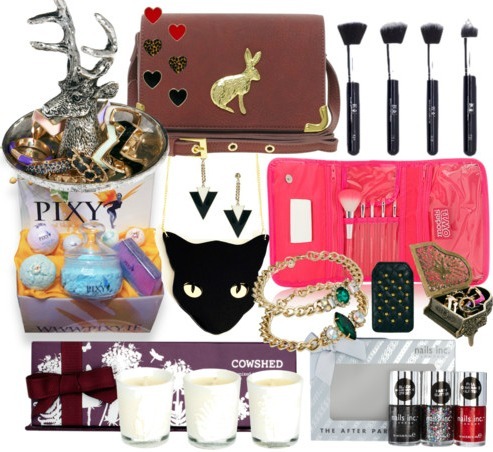 I decided to post a last minute gift guide for all of you lazy Christmas shoppers (I'm one too, don't worry). It was highly requested, so I thought I'd give it a go! Everything pictured above is currently available online, internationally - the items are from Asos, Motel Rocks, Blank Canvas Cosmetics, Pixy and The Button & Bow Factory. Each item should definitely be posted out to anyone in Europe in particular before Christmas, judging on personal experience. The product list above is made up all click-through links, so hopefully I've made your online shopping easier and stress-free. I believe there's something there for everyone; the Cowshed and Pixy sets would be ideal for your Mum, the Blank Canvas Cosmetics and Models Own brush sets would be fantastic for anyone ranging from a makeup artist, young teen getting into makeup or your best friend - whoever! Everyone likes jewellery also, so hopefully you spot an item above suited to some gal you know. I'd personally be over the moon the receive any of the above, and the array of different prices should suit a range of people's budgets. Happy Shopping!